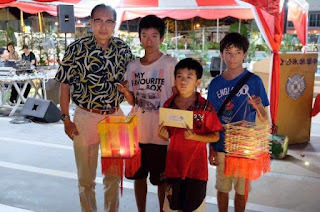 Attended the Lantern Festival at CSC. Thanks to Jane, Arata's team won the 3rd place of Lantern making competition. Arata worked hard to glue chopsticks! The award for the 3rd place was..... money! It's very Malaysian! 3 boys shared RM90.